Terricita10 and I had wanted to do this trip to historic Powers Garden from the moment we heard about it. I had several concerns on doing this trip such as the lack of reliable water, vague trails, access issues and that the Galiuro's where Powers Garden is located is out in the middle of no where; a true wilderness. Before we set out on this trip we got whatever trail information that we could find as well as; maps, GPS waypoints, useful info from HAZ member sredfield and then waited for the right weather. I'm glad we found out all we could since the waypoints from wayhoo.com were way off and the USGS 1996 topo map of the area has major flaws of the trails locations. We were very fortunate on our timing for this trip after finding out from a local cowboy we met that in his 14 years of punching cattle in this area that he never saw the water courses flowing the way they were in this typically dry range. We came a few days after a 2-week on and off again wet pattern, which deposited a good amount of snow on this range. The day before we came it warmed up into the 70-80 degree range and would stay like that on our 2-day trip thus melting almost all the snow. Before I get into this trip description I think I should write some things about this trip. For starters it's remote and don't count on getting any help if needed quickly. This trip is not for day hikers unless you are a real strong hiker who is experienced at route finding since the trails in this wilderness are confusing at times with many cattle trails intersecting them. Although its only a 21'elevation difference between the TH where we started and Powers Garden you must climb up to a saddle, drop into Sycamore Canyon, climb out to another saddle and then drop into Horse Canyon which will tie you into Rattlesnake Canyon. There are a lot of ups and downs along the way for a total elevation gain of about 2300' 1 way. Lastly don't relie on finding water here, we found a lot of bones on this trip telling us how hot and dry it gets in this area. After conducting our research we decided that we would start our trip from the Deer Creek TH. That seems to be the most easily accessed TH to the Galiuros and can be reached with a high clearance vehicle. To reach this TH you must turn off the Bonita/Klondyke road onto FR 253 and drive 8.5 miles to the TH. Your vehicle will be tested shortly after turning onto FR 253 since you will have to cross Arvaipai creek. All but the last few miles of the road are in good shape but you shouldn't have any problems as long as the road is dry. You'll eventually come to a TH sign by a gate saying Tortilla trail #254 but are directed a little further down the road to a parking area in a beautiful CG. 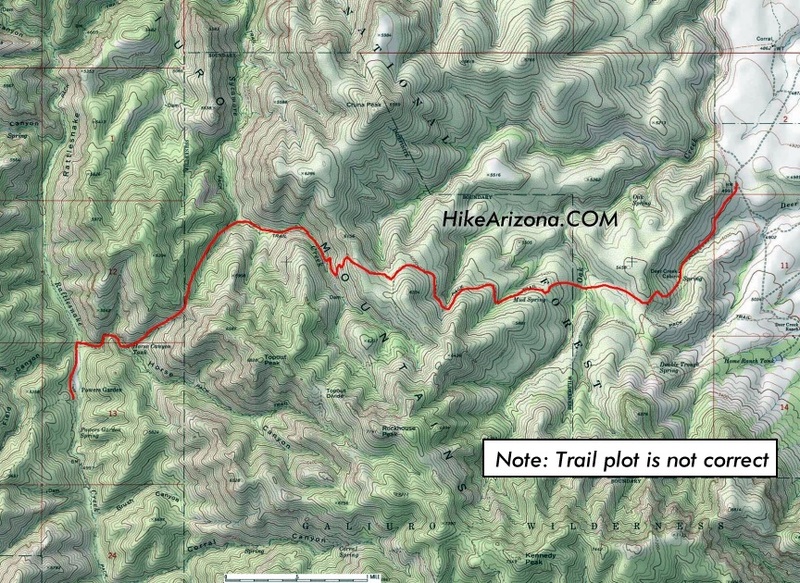 In this CG there is an information board on the wilderness and the TH for the East Divide trail #287. I have to add that at this CG you have an awesome view of both the Santa Theresa's and Pinaleno's, you can even make out the white boxed observatory on top of Mt. Graham! Our plan was to hike the whole way in on the Tortilla trail all the way down to the Powers Garden #96 trail. These 2 trails intersect about a 1/4 of a mile north of Powers Garden. Instead since we were treated to a babbling brook next to the E. Divide TH that leads up into the rolling hills, these rolling hills in turn overlook the tree lined brook, we decided after consulting our map and finding out that these 2 trails will intersect one another that it would be our route. There's a gate next to the brook, the 1st of 5 that we had to open and CLOSE on this trip. It was signed stating that there was no water to be found at Powers Garden, from the sight of the flowing brook and all the snow on the Galiuro's melting away in the warm sunshine we felt pretty sure that sign would need to be updated on our return. It is important to close these cattle gates since the cattle are allowed to graze in the wilderness. From my understanding and from signs posted on FR 253 the ranchers allow access to the TH's into the Galiuro's on roads that run thru their properties. The rancher if they want to and have done in the past around this wilderness is to construct gates and put locks on them to keep people out. So please don't piss off the ranchers. Once thru the gate we immediately encountered our 1st of 37 water crossings, once across the brook you'll stay on the southern side of the tree lined brook hiking up thru the rolling grassland hills that are dotted with scrub oak. You will then have to descend back into the brook and cross onto the north slope. You'll then have to hike all the way up the north slope to a fence line and head north along this fence line to a 2nd gate at a large saddle. At this gate the Tortilla trail intersects the trail that you're on coming in from the NE. Up to this point you've gone about 1.25 miles and have wonderful views of the above mentioned ranges as well as the Galiuro's Kennedy Peak just to your south. From the saddle after passing thru the gate on the well-defined trail continue on westward for about 1/2 a mile descending gradually to the 2 fork crossing of Oak Creek. Just west of the double-crossing on your climb out of Oak Creek there is a trail JCT. The faint left branch marked by cairns is the continuation of the E. Divide trail, you'll want to take the right fork. Strangely this is marked Sycamore trail #278. Don't ask me what happened to the Tortilla trail here but continue west and up on this trail. After a short time you'll encounter a water tank which your tempted to think is Mud spring which it's not. This area is the worst with cattle trails and care must be taken in choosing the right route. Stay about 150' to the south of the tank and continue heading west and you should find the trail. A few minutes after this tank you will come to another trail intersection by a corral, this is Mud spring, the spring is located behind the corral up hill a little bit. To this point you've gone about 2 miles from your vehicle and this is the Tortilla trail/Sycamore trail intersection, take the left trail (south) which is the Tortilla. After about 2-5 minutes hiking thru level grazing pastures you will see a faint trail branching to your right marked by cairns, take this branch. It's temping not to since your on a real good definable trail, we did and had to backtrack losing 1/2 hours time after meeting up again with the E. Divide trail. From this faint JCT you'll suffer for the next mile+ climbing a rocky ridge to a saddle, which is the entrance to Sycamore Canyon. Prior to this saddle you will get your last views of the Pinaleno's and you will have to pass thru either 1 or 2 cowboy fences. This saddle is about 1.25 miles from Mud Spring. At this saddle you will start your descent into Sycamore Canyon rather quickly. Just before reaching the creek at about 1/4 mile below the saddle you will come to another trail sign, your last for a while. On our topo this has to be the spot where the old Tortilla trail branches off faintly from the SE around the headwaters of the creek. The Sycamore trail from earlier comes in from the NW or right side of the creek. Our trail or new Tortilla will head down to the left side of the heavily wooded creek. You'll continue down Sycamore Canyon crossing it numerous times for about a mile before reaching what is called Upper Sycamore Spring Tank, this was not identified on our topo. The tank is painted woodland camo and out of order. Once passing the tank you will gradually climb away from the creek on it's SW side. Impressive views open to the north of the Santa Theresa's once again and down Sycamore Canyon. High on the NE side of Sycamore Canyon are some real cool looking red stone cliffs and if you look back down to the creek you can see parts of the Sycamore trail. As you hike up and away from the creek the vegetation changes to a desert variety with the likes of agave, prickly pear, manzanita, etc.. This stretch will last about 2 miles with a bunch of ups and downs on your way to Horse Pass and you basically contour around the SW side of the canyon passing around 2 good-sized feeder drainages that were pouring small waterfalls when we did our trip. Prior to reaching Horse Pass you will come across either 1 or 2 more cowboy fences. If you have a topo in which you should for this trip the pass is located between Peak 6394 to the NW and Topout Peak to the SE. At Horse Pass your view will change and you will be able to look down into heavily pine tree lined; Horse Canyon, Rattlesnake Canyon and the Western Mountain Divide of the Galiuro's. A note here is I saw no evidence of bark beetle damage. Although you can figure out were you want to go to reach Powers Garden you still got 2 miles with an elevation drop of 1100' to go to reach Rattlesnake Creek. I'd say 1/2 of that is accomplished via rocky switchbacks but after 5 hours with a pack on they hurt (We found the switchbacks weren't too bad on the way out). At the bottom of the switchbacks you'll be in Horse Canyon with about a mile to go. On the way out we found a downed trail sign at a faint intersection just a little above were the trail leaves the creek. We figured that the faint trail continuing up the creek as being the other side of the old Tortilla trail. Our hike down Horse Canyon was wild with 10 creek crossings to negotiate. With some of these we had to toss big rocks into to act as stepping-stones and with the others we rock hopped! I was really impressed on how weird a place this is, you have lots of pine trees in the canyons but scrub oak and desert vegetation at the higher elevations. As we approached Rattlesnake Creek we came upon 2 more cowboy fences with no gates and the ever-increasing sound of Rattlesnake Creek. When we reached the creek we realized we forgot to bring a raft. I'm not kidding; we couldn't cross the creek safely. Instead we headed south up river and were able to find a large downed pine tree, which spanned the river. I'd say the river was only 50' wide but with all that volume flowing below you it's a rush. I won't get into what's at Powers Garden so you can be as surprised as we were. I must say it's well worth the trip and I plan on doing this again and again. Take US 60 East to Globe. From Globe head East on US 70. Prior to reaching Pima, turn right (south) onto the Klondyke Road. You'll be on this road for a while and make sure you have gas, there is nothing along this road. You'll eventually come to an intersection in which you can either go left or right. Go left and drive about 4 miles to FR 253. 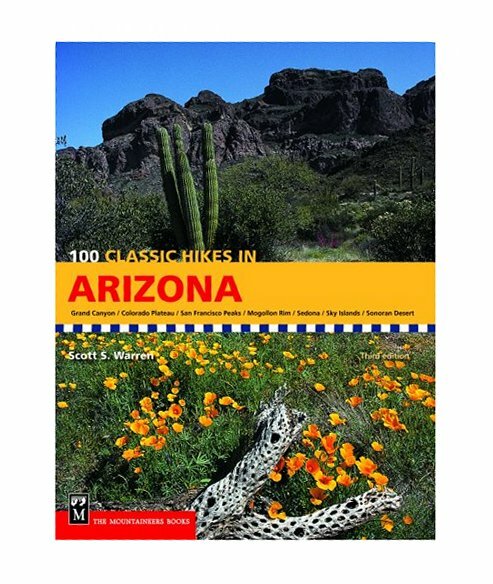 Read hike review for the rest of the directions. Drive time from Tempe 3 hours 30 minutes to TH.